Tracing The Intangible is a one man show on the artist's identity. This is explored through the viewpoint of Buddhist ideology and the relationship that is evoked. This show is transmitted as unique portraiture and moving image. My parents travelled from the South of China, laying down roots here in Liverpool, England in the late 1950s, the city where I was born and my work touches on the Diaspora and this cultural conundrum. This connection feels intangible but it is there nevertheless and I want to convey that. In my Illustrations from the series Portrait From The Afterlife, you will see me burrow deeper into the underbelly of my own identity and the link between past, present and future. 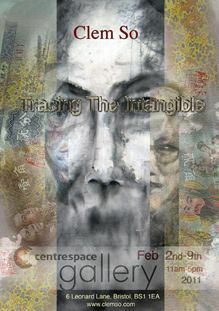 This is reflected in ancestral portraiture which begin with the flow of Chinese ink, bleeding, layering and merging with photographic elements such as oriental food and ghost money (traditionally burnt at funerals as an offering), suggesting, connection, memory, culture and the afterlife. Through a combination of the traditional and digital process, I am able to peel back and reveal hidden layers of abstracted texture and portraiture, as you have never seen before. Comprising of prints, drawings, paintings, table installation, sound and video you are instantly drawn into the exhibition environment and the artist's inner world. Sound, movement and visuals interlace to fully engage with the viewer. Past visitors have found this show to be either a enchanting or cathartic experience or a mixture of both. The show commands a genuine presence, conveying a over-whelming feeling of loss and our deep desire for connection. Our humanity is the tangible thread shared by all.